It’s one of the first things we discover as children, reading and drawing: Maps have a unique power to transport us to distant lands on wondrous travels. Put a map at the start of a book, and we know an adventure is going to follow. Displaying this truth with beautiful full-color illustrations, The Writer’s Map is an atlas of the journeys that our most creative storytellers have made throughout their lives. This magnificent collection encompasses not only the maps that appear in their books but also the many maps that have inspired them, the sketches that they used while writing, and others that simply sparked their curiosity. Philip Pullman recounts the experience of drawing a map as he set out on one of his early novels, The Tin Princess. Miraphora Mina recalls the creative challenge of drawing up ”The Marauder’s Map” for the Harry Potter films. David Mitchell leads us to the Mappa Mundi by way of Cloud Atlas and his own sketch maps. Robert Macfarlane reflects on the cartophilia that has informed his evocative nature writing, which was set off by Robert Louis Stevenson and his map of Treasure Island. Joanne Harris tells of her fascination with Norse maps of the universe. Reif Larsen writes about our dependence on GPS and the impulse to map our experience. Daniel Reeve describes drawing maps and charts for The Hobbit film trilogy. This exquisitely crafted and illustrated atlas explores these and so many more of the maps writers create and are inspired by—some real, some imagined—in both words and images. Amid a cornucopia of 167 full-color images, we find here maps of the world as envisaged in medieval times, as well as maps of adventure, sci-fi and fantasy, nursery rhymes, literary classics, and collectible comics. An enchanting visual and verbal journey, The Writer’s Map will be irresistible for lovers of maps, literature, and memories—and anyone prone to flights of the imagination. "Gathers intelligently charming meditations from writers and festoons them with map after map after map after map of imaginary, and sometimes non-imaginary, lands. (Only after several days of staring at the beautifully reproduced images did I force myself to read the words, but I am glad I finally did.) I am so enamored of this book that I bitterly resent what takes me away from it, whether that be the need to eat, or sleep, or write this review." "One of life’s great treats, for a lover of books (especially fantasy books), is to open a cover to find a map secreted inside and filled with the details of a land about to be discovered. . . . The Writer’s Map contains dozens of the magical maps writers have drawn or that have been made by others to illustrate the places they’ve created." "This handsome tome is a pure expression of that love [of maps] and of the interplay between magical prose and imaginary cartography. Sumptuous maps of notable fantasy worlds jostle for space alongside essays from fantasy writers. The Writer's Map charts the landscapes of literary imagination with passion and care." "Gorgeously designed. . . This delightful, engrossing exploration is for every reader who's ever admired a book or a map, let alone both." "Nothing less than a writer’s love letter to the map." "[For] the admirer of beautifully designed books often discovered in childhood and never left behind. . . . the quintessential coffee-table book." "Lewis-Jones’s beautifully produced compendium takes in everything from Utopia, charted for Thomas More’s satire of 1516, to Westeros, a continent in that swords-and-sorcery series Game of Thrones. It shows how writers of the past created worlds that have inspired writers of the present, from Joanne Harris to Robert Macfarlane. It’s a reminder that a map is far more than a means of plotting a route. Like a book, it can transport you. It can work magic." "Will delight the most devoted bibliophile." "We’ve hit the jackpot with The Writer’s Map. It’s a delightful collection of all sorts of literary maps . . . The art is the star here, pages and pages of every sort of map you can imagine, reproduced on oversized pages to delight and confound the viewer with their detail and imaginative depictions of a three-dimensional world reduced to two." 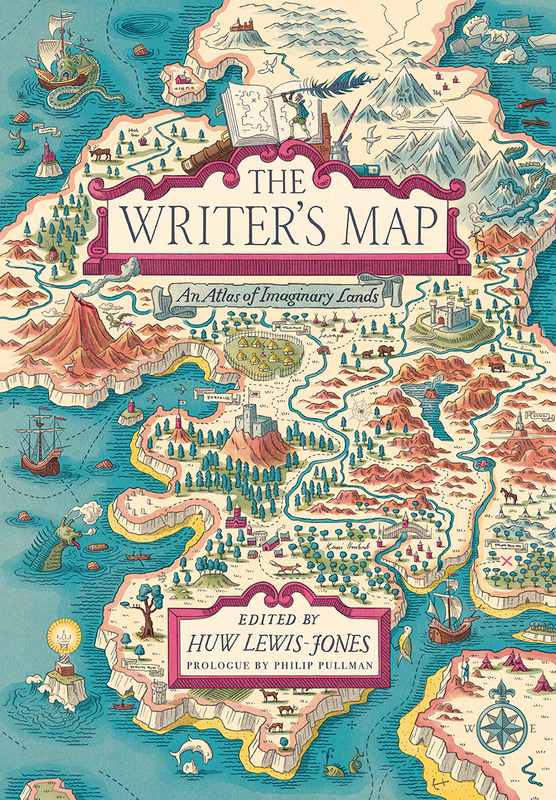 "Lewis-Jones has assembled a team of writers and illustrators and asked them to explain in personal terms what maps mean to them, how their love of the things came about and how maps figure in their own work." "A beautiful book. . . . Lewis-Jones has crafted an incredible love letter to invention, place, and the art of the map." "The Writer’s Map allows readers to tour worlds created by some of literature’s greatest storytellers. The beautiful book features a full-color collection of magical maps imagined by a range of authors, from classic novelist Rudyard Kipling to contemporary children’s author Abi Elphinstone. When compiled together, these maps compose 'a curious, creative gathering' any explorer is bound to enjoy."